Griswold Inn Post Office Cabinet from the collections of the Worthington Historical Society (WHS) may be used for educational purposes as long as it is not altered in any way and proper credit is given: "Courtesy of the Worthington Historical Society, Worthington, OH." Prior written permission of the WHS is required for any other use of Griswold Inn Post Office Cabinet. Contact WHS at info@worthingtonhistory.org to request permission. Griswold Inn Post Office Cabinet is realia, with genre furniture. It was created around 1810-1820. 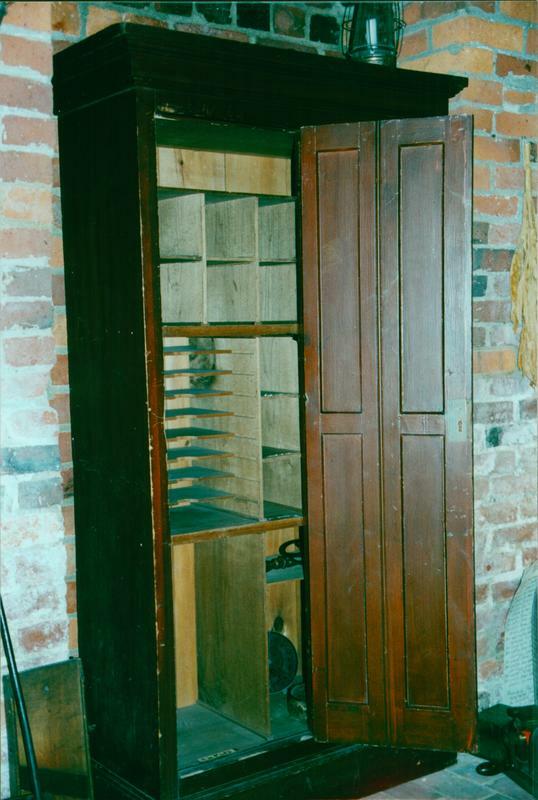 The post office cabinet pictured here was used at the Griswold Inn. George Harlow Griswold, son of Scioto Company proprietor Ezra Griswold and Ruth (Roberts) Griswold covered the mail route between Zanesville and Worthington. He served as Worthington Postmaster for several years during the 1840s and 1850s. It covers the topics Griswold Inn and postal service. The Worthington Memory identification code is whs0032.